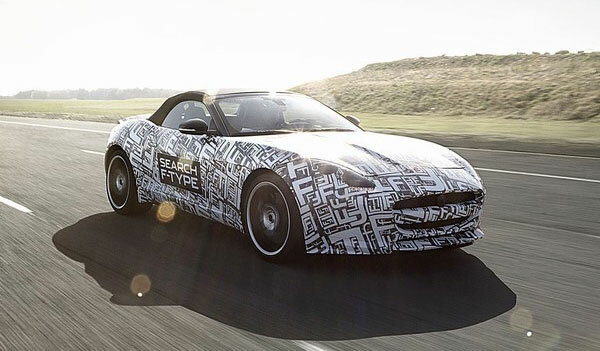 The Jaguar F-Type is the production name for the C-X16 Concept and will arrive as a Roadster first in early 2013. Despite Jaguar making it clear that F-Type isn’t supposed to continue the lineage of the D-Type and E-Type per se, it’s a nice nod to the past in a car that is the future. The Jaguar F-Type will arrive first as a Roadster in spring 2013, before the F-Type Coupe follows on a year later. Jaguar say the challenge was engineering the F-Type as a Roadster so they wanted to crack that before they delivered the Coupe F-Type. Jaguar are keen to deliver an F-Type that’s as close to the C-X16 as possible, but the Coupe won’t be getting the nod to the E-Type that we saw in its side-opening rear hatch. It’s not a practical solution and, nice though it was to see, that will bite the dust when the production F-Type Coupe arrives in 2014. But otherwise expect an F-Type that’s faithful to the C-X16 Concept. Engines on offer are likely to be a a fairly broad spectrum including the new V6 petrol and the V6 diesel with a hybrid setup of some description arriving a bit further down the line. As for driving dynamics, Jaguar reckon the F-Type will be as sharp – if not as powerful – as the XKR-S. This entry was posted in News and Events and tagged cars, concept engines, jaguar f type, rear hatch, transportation, type jaguar on April 5, 2012 by motorparks.